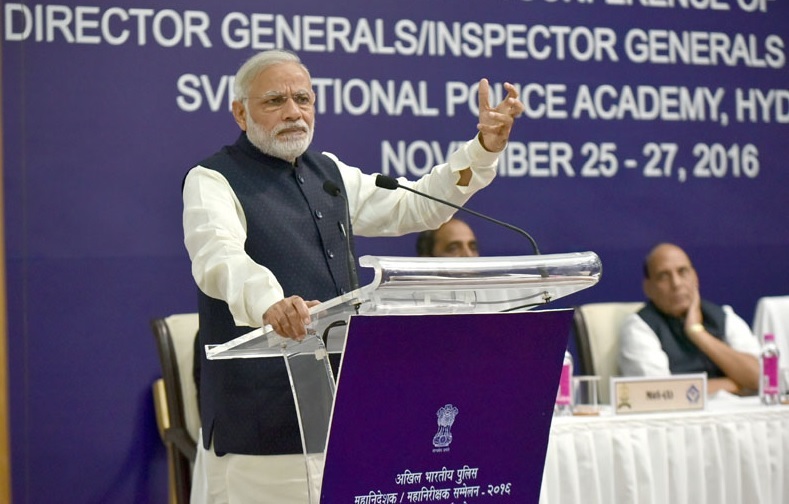 Hyderabad: Prime Minister Narendra Modi has called for a qualitative change in the police force through a collective training effort. Modi has also underscored the importance of soft skills and said that these are now essential, and should become a part of the training drill. Aspects such as human psychology and behavioural psychology should be vital parts of training, according to the Prime Minister. Modi was addressing the Annual Conference of the Police Chiefs of States and Union Territories and Heads of Central Police Organisations at the Sardar Vallabhbhai Patel National Police Academy (NPA) in Hyderabad. The Prime Minister said that technology and human interface are both important for the police force to keep progressing. He laid emphasis on concrete outcomes out of the actionable points that have been finalised. During the Conference, the Prime Minister launched a mobile app – Indian Police at Your Call. He also presented the President’s Police Medals for distinguished service to officers of the Intelligence Bureau. Tomorrow presentations will be made by the delegates on Challenges posed by Communication Technology, Technology Deficit in Policing and the threat of Radicalization. The 51st post-Independence DGsP/IGsP Conference-2016 was inaugurated by the Union Home Minister Rajnath Singh yesterday. The Union Home Minister also gave away the Indian Police Medals for meritorious service to officers of Intelligence Bureau and Ministry of Home Affairs. In his address the Union HOme Minister lauded the coordinated efforts of Central and State Intelligence Agencies for nipping in the bud any terror threat posed by the ISIS indoctrinated youth. He said the recent demonetisation move of the Government would impair the finances of anti-national elements and groups. The Ministers of State for Home Affairs, Kiren Rijiju and Hansraj Gangaram Ahir, Union Home Secretary Rajiv Mehrishi, Director (NPA) Aruna M Bahuguna, Heads of CAPFs and senior officers from Security and Intelligence Agencies are attending the three-day conference.